Take advantage of currency movements. Take advantage of currency movements with Citibank Dual Currency Account. Whether you are looking for currency investment opportunities or access to competitive interest rates with potentially higher returns than conventional investments, find out how our Citibank Dual Currency Account can cater to your needs. To receive interest at a rate that is potentially higher than that of other short-term investments. Access to a range of multi-currency. Flexibility to invest in different tenures to suit your risk appetite, expectation and requirements. Allows you to better manage your foreign exchange exposure and helps to diversify your existing investment portfolio. 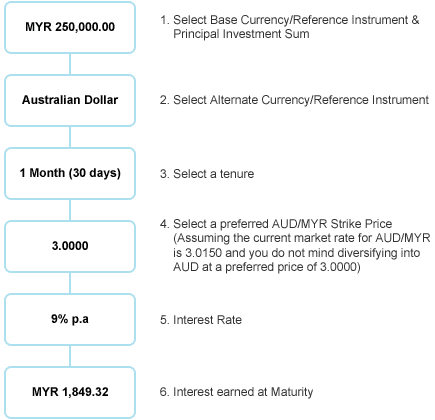 On the Fixing Date, it will be determined if you will receive your principal investment sum plus interest back in MYR or in AUD on maturity, depending on which is the weaker Currency/Reference Instrument when measured against your Strike Price. In the event that the exchange rate on the Fixing Date is equal to the Strike Price, you will receive your principal investment sum plus interest in the Base Currency/Reference Instrument (MYR 251,849.32). 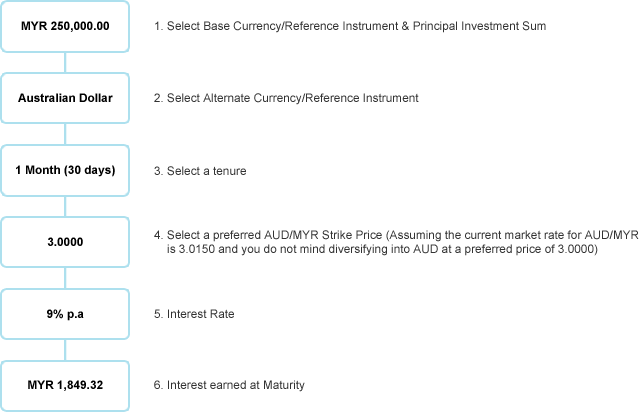 Should you be paid in your Alternate Currency/Reference Instrument (AUD), you may consider placing your AUD in our Citibank Foreign Currency Time Deposit account, or consider doing a reverse/cross pairing for your Dual Currency Account. Note: * In this instance, you must be aware that if you choose to convert your AUD back into MYR immediately, you may experience a loss to your principal amount as the prevailing foreign exchange rate is not in your favor. The above scenarios are meant for illustrative purposes only and are not indicative of future performance. Fixing Date is 2 business days before maturity date. Is the Citibank Dual Currency Account right for you? If you are indifferent to the two currencies / reference instruments chosen and want to earn a higher interest rate as compared to a traditional time deposit. In other words, you are comfortable receiving your investment principal in either the base or the alternate currency / reference instrument. If you hold a view that a particular currency / reference instrument is weakening. By selecting it as your base currency / reference instrument in a Citibank Dual Currency Account, you may earn a potentially higher interest rate. If your view holds true, you will receive your investment principal plus interest earned in the same currency / reference instrument. You are waiting to buy another currency / reference instrument for investment, diversification, business, migration purposes or perhaps, to finance your children's education overseas. In this case, you can potentially earn a higher interest rate on your base currency / reference instrument as compared to a traditional time deposit while waiting to buy the alternate currency / reference instrument at your preferred Strike Price. Before investing in a Citibank Dual Currency Account, you should be aware that a Dual Currency Account is subject to fluctuations in the rate of conversion between the base currency/reference instrument and the alternate currency/reference instruments. On the Fixing Date, should your alternate currency/reference instrument weaken when compared with your Strike Price, your principal and interest will be converted at your Strike Price to the alternate currency/reference instrument and repaid to you which, depending on market movements, may be less favorable than the prevailing market rate, upon maturity. Fixing Date is 2 business days before maturity date. Click here to view Dual Currency Account Product Highlights Sheet and here to view Dual Currency Account Product Term Sheet. *For any Market Linked Investments issued by Citibank Berhad, please refer to the relevant product highlights sheet for information on whether your investment is guaranteed by Citibank Berhad and insured by Perbadanan Insurans Deposit Malaysia (PIDM). THE RETURNS ON YOUR STRUCTURED PRODUCT INVESTMENT WILL BE AFFECTED BY THE PERFORMANCE OF THE UNDERLYING ASSET/REFERENCE, AND THE RECOVERY OF YOUR PRINCIPAL INVESTMENT MAY BE JEOPARDISED IF YOU MAKE AN EARLY REDEMPTION. THIS STRUCTURED PRODUCT INVESTMENT IS NOT INSURED BY PERBADANAN INSURANS DEPOSIT MALAYSIA (PIDM). A Dual Currency Account is unlike a conventional bank account as it is an investment and returns may vary. A Dual Currency Account is a structured investment product with exposure to one or more foreign currencies or such other underlying reference instrument. It is subject to a number of risks, including fluctuations to the currency rate or the value of the underlying reference instrument, which may provide both opportunities and risks. These movements are dependent on the market, not the bank. Foreign exchange controls may apply to foreign currencies. You should note that a Dual Currency Account is an investment product that should be held to Maturity. Early withdrawal of a part of a Dual Currency Account prior to the maturity date is not permitted. Early withdrawal of the whole of the Dual Currency Account is strongly discouraged because you will have to pay early termination costs and these will be deducted from the amount repaid under the Dual Currency Account, hence resulting in a loss of your principal amount. This document is not an offer to sell nor is it a solicitation of an offer to enter into a transaction and all expressions of opinion are subject to change without notice. The terms set forth herein are intended for discussion purposes only and are subject to the final expression of the terms of the transaction in the applicable documents which accompanies an application of a Market Linked Investment: Dual Currency Account. Prior to entering into a transaction you should consult with your own legal, regulatory, tax, financial and accounting advisors to the extent you consider it necessary, and make your own investment, hedging and trading decisions (including decisions regarding the suitability of this transaction) based upon your own judgment and advice from those advisers you consider necessary. In the event that you choose not to seek advice from a financial adviser, you should carefully consider whether this product is suitable for you in light of your investment objectives, financial means and risk profile. Although some of the information provided may have been obtained from various published and unpublished sources believed to be reliable, neither Citibank Berhad nor any of its affiliates makes any representation as to its accuracy or completeness or accepts liability for any direct, indirect, or consequential losses arising from its use. This product is not available to U.S. persons and may not be available in all jurisdictions.